A brilliantly funny story about how a little ink splot changes a family forever. Perfect for those who love Hoot, Holes, or Frindle and sure to be a hit with kids everywhere! The Rylance family is stuck. Dad's got writer's block. Ethan promised to illustrate a group project at school--even though he can't draw. Sarah's still pining for a puppy. And they all miss Mom. Enter Inkling. Inkling begins life in Mr. Rylance's sketchbook. But one night the ink of his drawings runs together--and then leaps off the page! This small burst of creativity is about to change everything. Ethan finds him first. Inkling has absorbed a couple chapters of his math book--not good--and the story he's supposed to be illustrating for school--also not good. But Inkling's also started drawing the pictures to go with the story--which is amazing! It's just the help Ethan was looking for! Inkling helps the rest of the family too--for Sarah he's a puppy. And for Dad he's a spark of ideas for a new graphic novel. It's exactly what they all want. It's not until Inkling goes missing that this family has to face the larger questions of what they--and Inkling--truly need. Kenneth Oppel has given us a small masterpiece of middle-grade fiction. 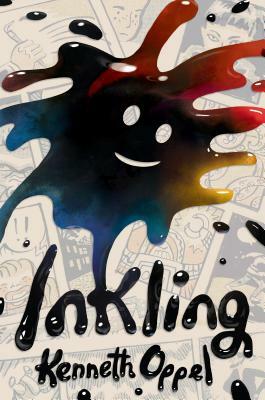 Inkling is funny and fizzy and exciting, and brimming with the kind of interesting ideas and dilemmas that kids will love to wrestle with. And Sydney Smith is creating wonderfully inky illustrations to bring the story to vivid life. Get ready. A little ink blot is about to become your new favorite character! KENNETH OPPEL is one of the most highly regarded authors of middle-grade fiction writing today. Among his books is the 2015 middle-grade novel The Nest, which received six starred reviews, was the Canadian Library Association's 2016 Book of the Year, a New York Times Editors' Choice, and was included on several notable "Best of 2015" lists, as well as Airborn, a 2005 Printz Honor Book. Find him online at www.kennethoppel.ca and @KennethOppel. SYDNEY SMITH is the illustrator of many award-winning picture books, including Smoot, A Rebellious Shadow by Michelle Cuevas, Sidewalk Flowers by JonArno Lawson, and Town is by the Sea by Joanne Schwartz, for which he was awarded the Kate Greenaway Medal. Sydney lives with his family in Toronto, Canada. You can find him on Twitter @Sydneydraws.